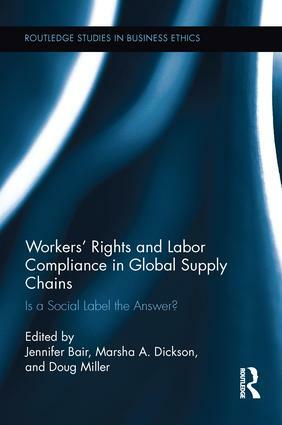 This book provides insight into the potential for the market to protect and improve labour standards and working conditions in global apparel supply chains. It examines the possibilities and limitations of market approaches to securing social compliance in global manufacturing industries. It does so by tracing the historic origins of social labelling both in trade union and consumer constituencies, considering industry and consumer perspectives on the benefits and drawbacks of social labelling, comparing efforts to develop and implement labelling initiatives in various countries, and locating social labelling within contemporary debates and controversies about the implications of globalization for workers worldwide. Scholars and students of globalisation, development, corporate social responsibility, human geography, labour and industrial relations, business ethics, consumer behaviour and fashion will find its contents of relevance. CSR practitioners in the clothing and other industries will also find this useful in developing policy with respect to supply chain assurance. To Label or Not to Label: Is that the Question?